The popular models in the Ratings were priced from $19.00 and Up , but don’t just shop for the price, look for options And check to see whether a monitor is fits your need. Make sure that the display on the monitor is easy to read and understand and that the buttons are big enough. The directions for applying the cuff and operating the monitor should be clear. Pick a top-scoring model that has features that will make testing easier for you, such as the ability of more than one user to store readings. 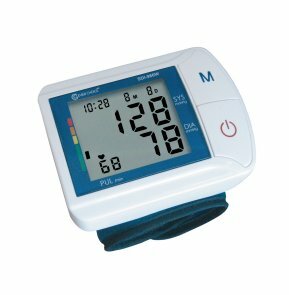 Blood pressure monitors may be available at a discount, and some insurance plans may provide coverage for them. Check with your provider. Most Insurance company May cover only High price models which may lead you to Pay Copay, Some meter At our Store are sold as low as your Copay in some case they may not be covered by your Insurance company simply because most insurance company get kickbacks from Manufacturers. In that case look at the model look at the options, check the rating of the Manufacturer like Simple Diagnostics, Sure life Blood pressure monitor. As new as they are in Manufacturing Game some of these company stand up behind their products and warranty and These new Manufacturer are coming with some Really New Technology in Blood Pressure Monitors and Blood Glucose Meter. Well simple answer is this. Lets face it , most of us are shopping online for brand Name, Yes Brand Brand And Brand. While other Who shop for brand with Options. Remember, not everything that is cheap or inexpensive is bad, sometimes these New Manufacturer are Only trying to get in game to build the company name at the same time the new companies are also aware that People online now a days know how to shop. While they are building Brand Why not take an advantage of this time and give these new Companies a chance.